Luciana “Luka” Dias was born on December 4, 1962 and began her martial arts career in judo under Petrucio Monteiro while studying physical education. About two years later, in 1986, Luka met Wellington “Megaton” Dias who introduced her to BJJ at a summer camp in Rio de Janeiro. She started training jiu-jitsu with the Machado brothers in Teresopolis City, and earned her blue belt under them in August 1988, and her purple belt in February 1998. Yes, it’s not a typo, it took Luka 10 years to go from blue to purple because of work, moving, and life general. After graduating from the university she moved to Florida in 1989. Luka and Megaton reconnected in the US in 1996, and Megaton became her mentor, coach, and husband. Luka has been an active competitor in judo and BJJ for decades, her most recent tournament being the IBJJF European Championship in 2014. She is one of the highest ranked female black belts in the world, and a huge supporter of women’s jiu-jitsu. I would say purple and brown were definitely the most challenging belt levels for me. Purple belt was hard because I felt more advanced and, wanted to prove more to myself and my professors. It was the rank where I felt more power, and that my technique was solid. It was also most challenging time in my competition career. I had to compete against brown and black belts. We did not have enough women in the sport so the brackets were combined from purple to black. The brown belt for me was more about focusing on getting my black belt. It was the time to refine and polish the techniques. I received my brown belt in 2001, and was finally awarded my black belt in 2003 by Royler Gracie and Megaton. Ladies, we all have hard time in training but remember that you are strong, and you can do multiple tasks. Never stay away from the mats too long because the longer you are out, the harder it is to come back. Injuries are common in our sport, you have to get used to it. Treat your injuries well, and listen to your doctor! Try to have a good quality workout, and follow a health- conscious diet. Each day is different, some are good, some are not so good but try to learn something from your professors and higher ranked teammates every day. Respect to earn respect! Most importantly, be humble about your success, don’t try to be all that! Remember where you came from, and all the people who helped you along. 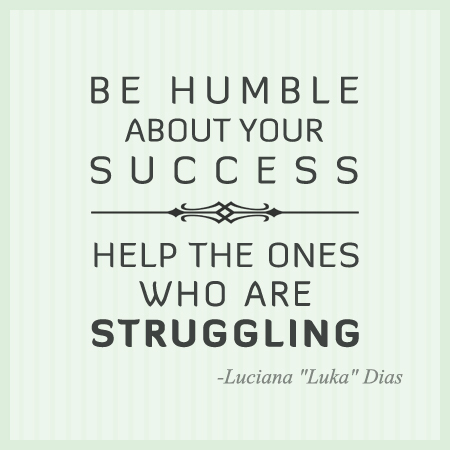 Help the ones who are struggling. Your good qualities will appear with humbleness. Always be honest and true to yourself. Keep training hard! Love you all!! !